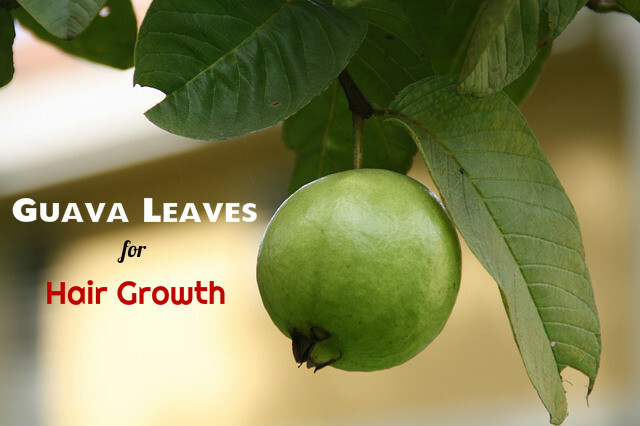 Guava leaves are now gaining popularity with its benefits for hair. It is said that they are wonderful for hair loss. It is also said that they help in making your hair thicker. Hair fall is often the result of unhealthy scalp conditions. Guava leaves have analgesic, anti-inflammatory, antimicrobial and antioxidant properties. All these make it great for keeping your scalp healthy. Using it in hair rinse can treat dandruff. It is also a rich source of vitamin B and C. These vitamins nourish the hair follicles and help in hair growth. How to Use Guava Leaves for Hair Growth? Using guava leaves on your hair help in making your hair soft and lustrous, as well as thicker. Using guava leaf lotion on hair gives good results. It is very simple to make. Below are given steps on how to make this lotion. Pour the water in to the pot and heat it on the stove. Let the water boil. Add the guava leaves to the boiling water. Let it boil for about 20 minutes. Strain the liquid and cool it. Before using guava solution on your hair you have to wash and cleanse your hair using shampoo. Do not use conditioner on your hair. Let your hair get dry. Now section it and start applying the guava leaf solution on your hair. Massage your scalp with this solution for at least 10 minutes and make sure that all your hair is saturated with the solution. When you apply the solution, make sure that you give extra attention to the roots and tips of your hair. Let this solution remain on your hair for about 2 hours. You may also wrap your hair in a towel and leave it overnight. Wash your hair with lukewarm water and rinse off the solution. If you are having hair fall problem, you can use this solution 3 times a week. If you are using it to increase the growth of your hair and to keep your hair lustrous, you may use it twice a week. You should take care to cool down the temperature of the solution to room temperature before you use it on your hair. Do not use hot water to rinse your hair. This can make your scalp and hair dry by stripping off the natural oils on your scalp. The restorative properties found in guava leaves get transferred into the water when you boil water with the guava leaves. By applying this solution on your hair regularly, you will be able to reduce hair fall. This solution is also good for those who have oily hair. This solution also acts as a leave-in conditioner. Guava leaves are rich sources of Vitamin C. This vitamin helps in boosting the activities of collagen. This way it helps in making your hair grow faster and healthier. The antioxidant properties of guava leaves make it great for fighting against the free radicals. This way it helps in preventing damage caused to hair. It is also rich in lycopene. This makes it very beneficial for protecting your hair from the harmful ultra violet rays of the sun. Massaging the lotion on your scalp is very effective for increasing the circulation of blood in your scalp. This enables the hair follicles to get more nutrition. As a result, your hair will start growing better. Using guava leaves is also good for removing the dirt and grime that have built up on your hair and the follicles. This way they unclog the follicles and help in preventing oiliness and dandruff. By removing the dirt guava leaves help in making your hair smooth, soft and shiny. You can also combine the juice of guava leaves with other ingredients to get the best results. Using guava leaves with natural oils is an excellent way to ensure that your hair gets all the essential nutrients and does not get damaged with the chemicals. Mix the boiled guava concoction with natural oils like olive oil or coconut oil. This way you will get the benefits of both the ingredients. Honey on its own is of great benefit to your hair. But when it is mixed with guava leaves, it is even better for your hair. Your hair will get the nutrients from both the ingredients. This mixture is also a good conditioner. All you have to do is to boil guava leaves and mix honey to the juice. Mix well and apply on your scalp and hair. This nourishes your hair and makes it grow well. One of the greatest benefits of using guava leaves is that they are organic and natural. The hair care products that you buy from the market contain chemicals that can be harmful for your hair. Although you may get some results in the beginning by using these chemical laden products, they actually cause damage to your hair in the long term. It can lead to hair thinning and even hair loss. Other than being beneficial for preventing hair fall and stimulating hair growth, guava leaves also have medicinal properties. They are effective for soothing and controlling various ailments. Using natural products like guava ensures that you do not add these additional chemicals into your hair, which can negatively affect your hair and scalp. Moreover, your hair is provided with nutrients when you use natural ingredients. They also provide a solid foundation for long-term health and growth.